Troubled schools on trial: What does a high school diploma prove? Bridgeport Superintendent Fran Rabinowitz testifies. This seeming paradox – rising graduation rates coupled with low standardized test scores and high demand for remedial courses – was among the reasons that Hartford Superior Court Judge Thomas Moukawsher ruled that the state fails to provide students with the education the state constitution says they are entitled to. 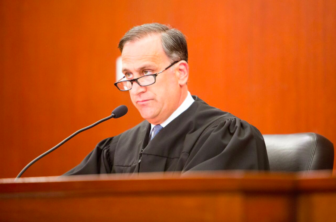 When the Connecticut Supreme Court ruled six years ago that the state is responsible for providing students with an education that is “minimally adequate,” the controlling opinion concluded the state is not always on the hook when students fail. “The obligation to provide a minimally adequate education must be based generally, not on what level of achievement students reach, but on what the state reasonably attempts to make available to them,” Justice Richard N. Palmer wrote. In other words, does the state give students the opportunity to succeed? After a five-month trial, Moukawsher ruled that passing students from grade to grade, and eventually giving them a diploma, without any meaningful state standards to ensure they had learned what they should have, is irrational and therefore unconstitutional. It’s not a new dilemma, but political and fiscal pressures have stalled reform efforts repeatedly. Students from low-income families are significantly less likely to graduate high school than their peers. In 2011, Connecticut had the nation’s worst gap in high school graduation rates between impoverished students and their better-off peers. Since then, graduation rates in many of the state’s lowest-performing districts have steadily increased, and Connecticut has seen the fastest narrowing of this achievement gap in the nation, the Johns Hopkins University School of Education reported. With those higher rates came annual media releases, press conferences and a new talking point from local and state officials boasting about how well things were going in the most impoverished districts. East Hartford Nathan Quesnel, at microphones, celebrates his district\’s graduation rates increasing. Gov. Dannel P. Malloy and State Education Commissioner Dianna Wentzell are up next to cheer the result. “Here in East Hartford, the numbers are extraordinary. So, you get a very big thank you,” Gov. 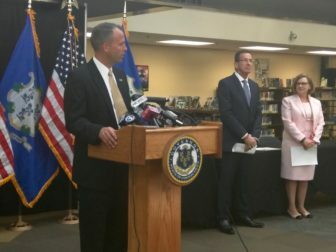 Dannel P. Malloy told local educators during a May press conference to celebrate the record-high statewide graduation rate. 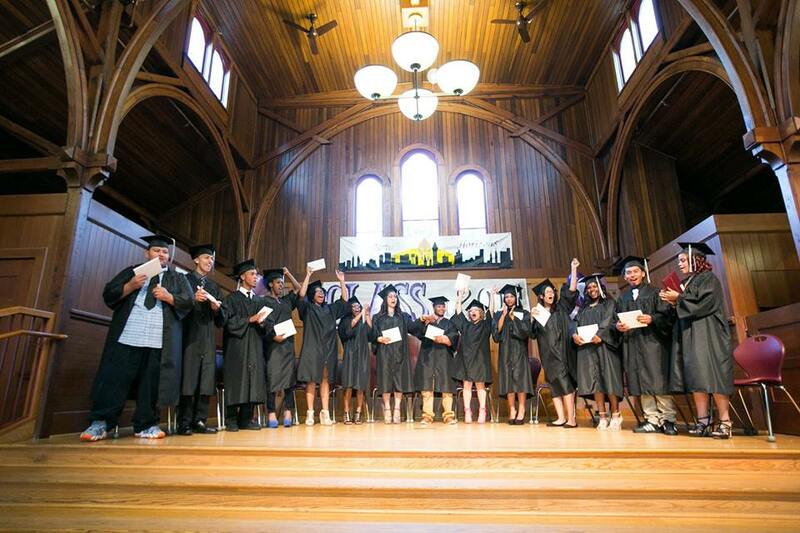 In East Hartford, graduation rates have jumped by 14 percentage points. Double-digit percentage increases also occurred in New Haven, New Britain, Bloomfield and Hartford. So what should the public make of the fact that thousands more students now receive a diploma, even though many of them are showing up at the state’s public colleges unprepared? Malloy said the state’s shift to the Common Core State Standards – an approach to education instruction rolled out a few years ago – is helping students achieve more, and eventually will address the large number of students showing up for college in need of high school-level instruction. “These things follow one another,” the Democratic governor said. Meanwhile, graduation rates are significantly misaligned with the rate of high school juniors who are reading and doing math well enough to begin taking college-level courses, SAT results show. In East Hartford, for example, SAT test results show 44 percent of juniors last year were college- or career–ready in English while graduation rates have topped 75 percent for years. Many of these low-income students who enroll in college will never finish their degree. Among Connecticut’s Class of 2013, one-in-five impoverished students earned a college degree within six years compared to one out of every two students who come from non-disadvantaged backgrounds. When the Connecticut Coalition for Justice in Education Funding – a group of parents, students, local educators and municipal leaders – filed this lawsuit 11 years ago, they aimed their criticism at the education students from low-income families were being provided. So how did East Hartford increase its rates? But he also shared how each year, 75 to 80 high school seniors short of the credits they need to graduate stay after school to complete online courses. “The content is there, but the difference between classroom discussion and working together vs. reading it on a computer and answering a quiz – I don’t think they compare,” Ryan testified of online courses. Ivanisha Pedrogo, 16, take a Algebra I course on a computer at Hartford’s Pathways to Technology Magnet High School. Online courses “have proven to provide abysmal results for our kids,” testified William Thompson, the principal of New London High School. The popularity of online learning has exploded in recent years. Software is promoted as a way to complement traditional classroom teaching and to motivate students who have failed in the classroom environment. In 2010, the legislature mandated that school districts with high dropout rates provide the option to take courses online to students in danger of failing to graduate. But so far, Connecticut’s venture into “virtual learning” has resulted in a hodgepodge of computer programs in various districts with no oversight by the State Department of Education or any other state agency. “The online work must be ‘equivalent, rigorous, systematic and engag[ing],’ but the law doesn’t make these words actually mean anything,” Moukawsher ruled. Nearly every state in the U.S. has increased graduation rates. President Obama celebrated the increases earlier this year during his State of the Union speech. “More of our kids are graduating than ever before,” he said. The federal government in 2005, under the No Child Left Behind Act, threatened to hold states accountable if their graduation rates didn’t increase. However, the feds left it up to states to determine who graduates. “Standards are up to states. Graduation rates are up to states,” U.S. Education Secretary John B. King Jr. told reporters during a conference call this fall to celebrate record-high U.S. graduation rates. National Public Radio looked into how several several states increased their graduation rates found three primary drivers: Students who fall behind receive help to catch up; standards are lowered to make it easier to get a degree; or likely dropouts are moved off the books by transferring them or misclassifying them. The U.S. Department of Education’s Office of Inspector General in November announced that it plans to investigate whether selected state agencies “have implemented systems of internal control over calculating and reporting graduation rates that are sufficient to ensure that reported graduation rates are accurate and reliable.” Currently, they are looking into the graduation rates reported by Alabama and California. Connecticut officials have attempted to broaden the way schools are measured to lessen the high-stakes focus on graduation rates. Each year, the state grades every school based on 19 different measures, such as how many students are chronically absent, how many enroll in arts and advanced placement college-prep courses, and how their students perform on state exams. For high schools, graduation rates and the percentage of students on track to graduate in four years account for 20 percent of a schools’ rating. Schools are expected to have at least 94 percent of their students graduate on time. Aside from the public embarrassment of getting a poor grade from the state, schools rated the worst actually are given priority for extra state funding when it becomes available. Tightening educational standards also can come into conflict with efforts to keep students from dropping out. For example, there is a concern that holding students back leads to an increase in the number of dropouts. “They begin to feel hopeless when they do not begin to accrue credits,” testified Rabinowitz. When Wentzell was one of the top leaders of Hartford Public Schools, she testified that the district kept more kids in school – and therefore on track to graduate – by ending the practice of automatically failing students who missed more than 24 days of class in a semester. Economists who testified during the trial said the prospects for many who do not earn a high school diploma are dire. Henry Levin, a professor who specializes in educational economics at Columbia University’s Teachers College, testified that the majority of those incarcerated in Connecticut prisons have less than a high school diploma. An analysis he prepared for the trial as a witness for the coalition suing the state found that the lifetime earnings of Connecticut residents who don’t complete high school are $480,000, compared to $733,000 for graduates. Those who go on to earn a college degree earn $1.4 million. “The quality of education is going to determine whether people are able to get jobs, or whether they are even able to interview for jobs,” testified Levin. A high school diploma is a strong indicator of whether someone has a job in Connecticut, his analysis concluded. While a high school diploma may help open the next door, the judge raised concerns throughout the trial that students are having to pay for courses in college to get the education the state constitution entitles them to. Connecticut students pay $10.5 million each year to take these non-credit, remedial courses, reports the Center for American Progress, a left-leaning national think tank. ‘Soft bigotry of low expectations’? The landmark 1983 publication “A Nation at Risk,” prepared for President Ronald Reagan, blamed the setting of low minimum expectations for public school students for “a rising tide of mediocrity” that threatened the economic future of the country. “I think that the belief that it’s hopeless and so you have to just pass them along, it was at one time called the soft bigotry of low expectations,” testified Wentzell. The judge’s solution: Have the state legislature or education department mandate that students show they are competent in core subjects before they receive a diploma instead of leaving the decision to local officials. The easiest way to restore public confidence in a diploma, the judge said, would be requiring students to earn at least a certain score on the existing state exams. It’s an approach many states have taken, including Massachusetts and New York, but one which is sure to generate considerable opposition. Fifteen states this school year will require students to pass exit exams to earn a diploma, and five other states have passed laws requiring it in the future. However, 10 states have dropped exit exams since 2011, reports the Education Commission of the States, a nonprofit think tank that tracks state legislation. Other states have awarded different types of diplomas, depending on the level of achievement a student is able to demonstrate. In Connecticut, no such distinction exists. There have been efforts to overhaul graduation standards in the state, but they have largely stalled. When vying for federal Race to the Top money in 2010, the state passed legislation that would require students, beginning with the class of 2018, to earn more credits to graduate, complete a senior project and pass graduation exams in algebra, geometry, biology, American history and English. After failing to win that federal grant – and amid pushback from local education leaders – state legislators have voted to delay the reforms year after year. With next year’s freshmen slated to become the first cohort finally held to the higher standards, the legislature this past spring delayed them again. 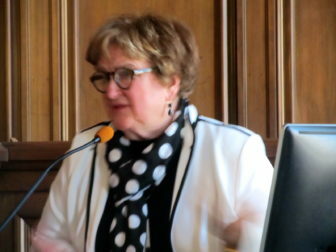 If Connecticut moves forward with exit exams, “There would be concern at a lot of different levels that – you know some people would feel perhaps it wasn’t fair, fair to the kids,” testified Wentzell. After they had delayed the graduation reforms a second time, state legislators set up a task force of education officials to study raising graduation standards. That panel concluded its work earlier this year. It its final report, it recommends scrapping the legislation that requires students to pass exit exams. It offered no alternative, which frustrated the judge. Instead of mandating proficiency, the state education board has adopted guidelines for content students should master at various educational stages and has left it up to local districts to decide whether to follow those guidelines in promoting students. “We want to move toward an approach where mastery of the material is the standard for graduation,” testified Wentzell, noting that 20 of the state’s 352 high schools have voluntarily moved in that direction. But the judge said standardized test scores make his conclusion that undeserved diplomas are being awarded undeniable. One-third of high school juniors are not reading and writing well enough to take college courses or start a career, SAT results released in August showed. While thousands of those students are close to being where they should be, one out of every six high school juniors in Connecticut is significantly behind. Tracey Snyder, an East Hartford science teacher, finds it difficult to cope with the number of students showing up in her class who are multiple grades behind in reading. Some students aren’t able to read her tests. Words like abundant, faucet, hence and either are not in many students’ vocabularies. So while they understand and excel during oral lessons, they struggle on the written exams. Last year, she failed 17 of her 87 students. Most moved on to the next grade.